Since the proceedings of the Tucson convention were never ratified by the United States Congress, the Provisional Territory was not considered a legal entity. For a time it operated as a de facto, if not de jure, government for the intended Arizona Territory. Dr. Lewis S. Owings, Governor of the Provisional Territory, appointed James Henry Tevis to raise the first Territorial Militia. This comprised three companies of Arizona Rangers for the protection of the Territory from marauding Apaches and bandits. Two companies were raised in the Pinos Altos mining camp, and another at Mesilla. In March 1861, the citizens of Mesilla called a secession convention to join the Confederacy. On March 16 the convention adopted a secession ordinance, citing the region's common interests and geography with the Confederacy, the need of frontier protection, and the loss of postal service routes under the United States government, as reasons for their separation. The ordinance proposed the question of secession to the western portions of the territory. On March 28 a second convention in present-day Tucson met and ratified the ordinance. 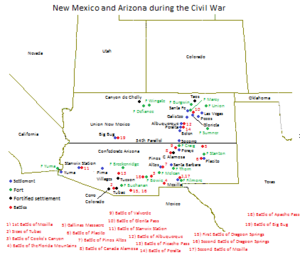 The conventions subsequently established a provisional territorial government for the Confederate "Territory of Arizona." Owings was elected again as provisional governor and Granville Henderson Oury was chosen as a delegate to petition for the territory's admission into the Confederacy. The proposal to organize the Confederate Territory of Arizona was passed by the Confederate Congress in early 1862 and proclaimed by President Jefferson Davis on February 14, 1862. Coincidentally, Arizona statehood was approved exactly fifty years later on February 14, 1912.